Formative assessment is a process during the course of instruction by which teachers assess students’ knowledge, give feedback, and adjust the lesson as needed - even on the spot. Formative assessments are designed by the teacher in order to find out whether instruction is taking hold on a daily basis so that interventions can begin immediately. 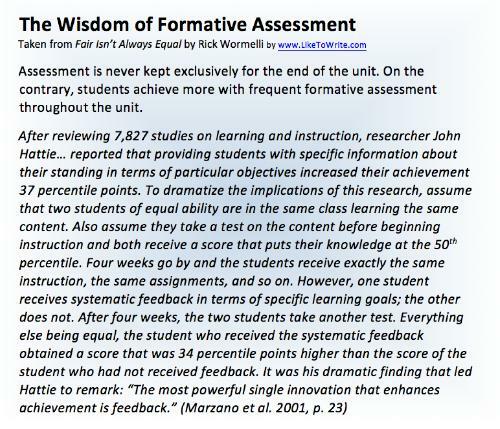 Formative assessments are not usually graded, but they can be. The key to an effective formative assessment is that the teacher intervenes immediately with the student who is falling behind and extends the learning of the student who has mastered the objectives. Some argue that formatives are difficult to grade and might not give the teacher accurate data. Often the student is asked to assess what he learned and his self-reporting might not be accurate. When I design formative assessments, I want to see if students can explain what they’re learning and why they’re learning the objectives. 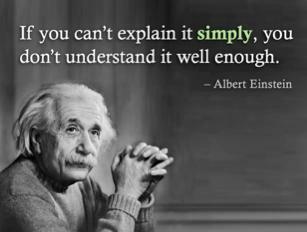 It’s important to me that students can explain how they will apply the new learning. My favorite formative assessments are (1) the exit sheets, (2) I-learned, I-Will statements; (3) drawings, (4) Star Charts, (5) Reader Response Checklists, (6) Double-Entry Journals, and (7) the interactive notebook (daybook). Each one of these assessments is explained in detail on the pages of this Website. Formative assessments should not be confused with summative assessments. Summatives are measurements by which teachers assess students’ progress at the end of a unit, grading period, or a year. There are many different kinds of summative assessments designed by the teacher, the district, or the state. End-of-chapter tests graded by the teacher fall into this category as do Benchmark Tests administered by the district and scores that are used for accountability purposes by the state such as AYP. The difficulty with summatives is that often the information comes to the teacher too late for her to act upon it and intervene effectively. Despite the advantages and disadvantages, both types of assessments are important in a proficient reader classroom. 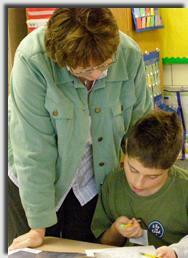 The teacher can learn much about students by analyzing all data available to her. Many teachers ignore much of the summative information. They don’t read what last year’s teachers put in the cumulative folders because they say they don’t want to be biased against their students. There is important information in those folders though including learning disability information, the progress the student made the year before, and recommendations by last year’s teacher that need immediate attention. This summative data is crucial to know and understand when making a plan for the students’ instruction. This video explains student self-assessment and what it looks like in the classroom. Hear students and teachers from IS 223 (Brooklyn, NY) explain self-assessment and reflect on their experiences using self-assessment in the classroom. A young man, James Schmidt, explains the value of learning self-reflection so we can improve our lives.